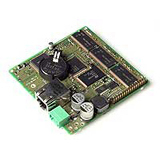 AXIS 282 Bare Board Video Server is designed to migrate your analog investments into high-performance IP solutions for surveillance and remote monitoring. The AXIS 282 accommodates one analog video stream. The unit is ideal to be built-in as an integrated part of a product or system.